Sept. 16 (UPI) — A new natural gas leak was reported in Lawrence, Mass., on Saturday morning, two days after explosions and fires rocked the city and other towns north of Boston. At 11 a.m., the latest leak was confirmed, according to WBZ-TV. After a strong odor was reported, firefighters stopped people from walking in the area. On Thursday, about 8,500 residents were forced to evacuate from their homes. Gas utility representatives are going door to door to shut off meters and check for residual gas within the home. Columbia Gas is owned by NiSource, which serves nearly 4 million natural gas and 500,000 electric customers across seven states. 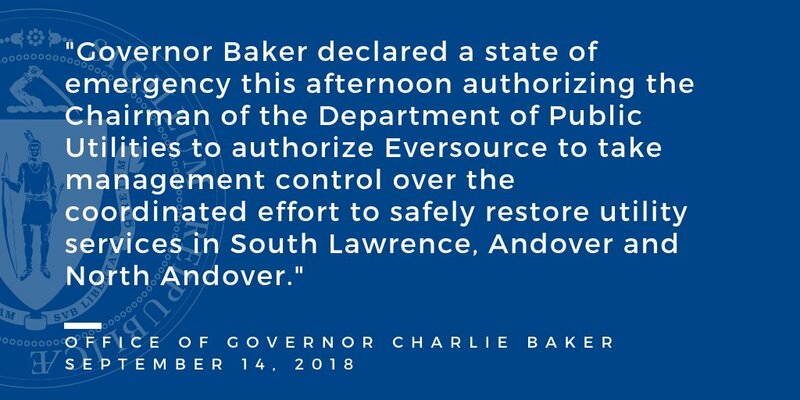 The governor said he decided to declare a state of emergency after he spoke with state and local officials, including Lawrence Mayor Dan Rivera. Approximately 5,015 gas meters were affected in Lawrence, the city posted on its website. Another 2,000 gas meters were affected in Andover and 1,600 in North Andover. He announced the opening of a claims hotline and plans to set up a claims center. “Our focus today and in the coming days is to support the Merrimack Valley and ensure the safety of the communities that we serve,” he said. An 18-year-old man was killed Thursday as 40 homes and businesses burned from the gas incidents. Massachusetts State Police reported 70 incidents of fires, explosions, gas odor in Lawrence and Andover. The blasts were likely caused by over-pressurized gas lines to individual residents, Andover Police Department Lt. Eddie Guy told NBC’s Today television show Friday morning.